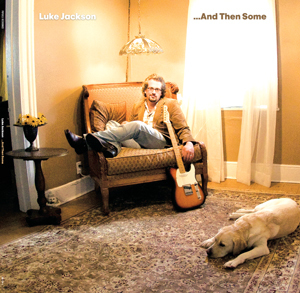 Luke Jackson …And Then Some in stores now! Listen to the entire album NOW and share Luke’s E-Card with your friends! It’s just a few days until my big album launch show on Thursday night (November 6th) at The Rivoli in Toronto. This is the only scheduled local show, and surely the only show I’ll do with a band and a string quartet for a long time, so you really don’t want to miss it. The album comes out tomorrow (Tuesday the 4th) all over North America. Theoretically, you can buy it in any bricks and mortar record store in North America, but in reality, if you like to support your local record store (and I love you if you do), you’ll probably have to order it. Just tell the store that the album is distributed by Darla (in the States) or F.A.B. (if you’re in Canada). If you want to order the CD online, there are many options. Our own Popsicle Webshop has the CD and LP versions of the album as well as the Come Tomorrow 45/DVD/hidden download package. Not Lame is a long-time favourite vendor of superlative pop music, as is KoolKatMusik. You can also buy the CD at the ubiquitous CD Baby, and if you’re in Japan, Apple Crumble Records and Fastcut Records both carry the CD and the Come Tomorrow 45/DVD. Luke Jackson‘s second UM release …And Then Some will be our very first release on glorious half-speed mastered, 180-gram audiophile 12″ vinyl, in a snazzy gatefold sleeve of naked children traipsing about Dunluce Castle… no, wait, that’s Houses of the Holy. But we can assure you it has a photo of the world’s most photogenic labrador retriever. …And Then Some’s lead-off single “Come Tomorrow” will be available as a fetching 7-inch vinyl single (also in a gatefold sleeve!) with a bonus DVD of the song’s music video to boot. Both are released in association with Luke’s own Popsicle Recordings, with whom we also released Favorita, the self-titled, posthumous debut album by the nineties Swedish pop phenoms of the same name. Release date on both releases imminent. Luke Jackson has temporarily relocated from Toronto to London where he is currently in the process of booking solo and band shows, and working on his highly unanticipated third album at a veritable snails pace.